Hello again! In tonight’s second post, I’ll be sharing swatches of a few polishes from MDJ Creations. All polishes reviewed in this post are currently available for purchase through their Etsy storefront. 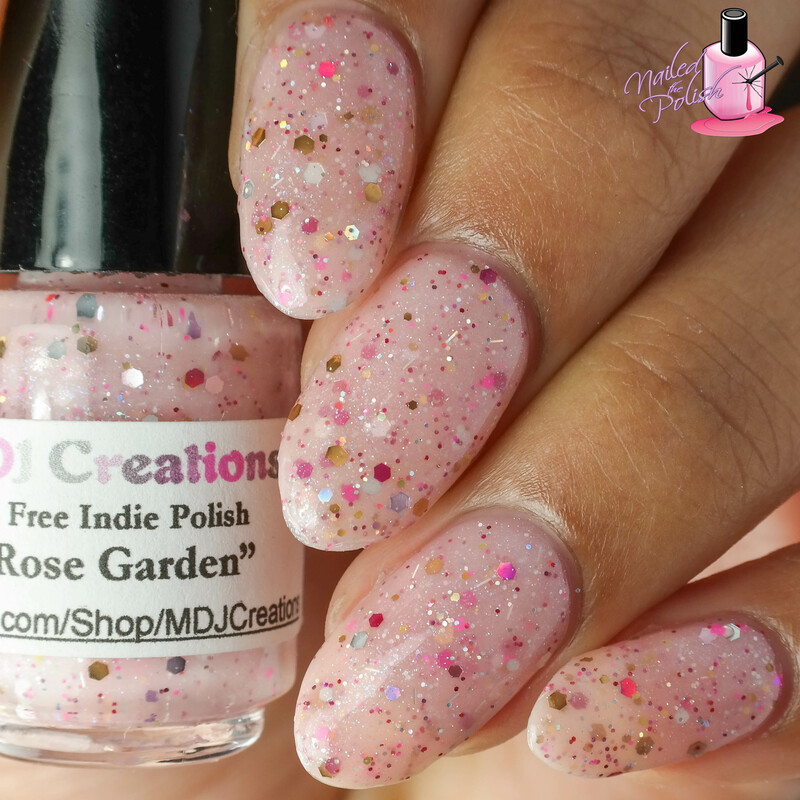 Rose Garden is a soft pink crelly with added glitters of various shapes and sizes in pink, copper, orange, light blue, silver, and holographic. Shown here is three coats plus top coat. This polish is a little on the sheer side but it builds to a nice opacity. The formula is pretty nice and I didn’t have to do any fishing for the glitters. I think the choice of glitter colors compliments the soft pink base very well. I Was a Mermaid Once is a light pink base glitter topper filled with light pink, dark pink, red, and holo glitters of various shapes and sizes. Shown here is one coat over Lavish Polish’s Bikini Bottoms plus top coat. When I say this polish is filled with glitters, I mean it’s FILLED with glitters. I couldn’t believe how much coverage I got with just one coat of this polish. For a glitter topper, the formula is pretty great. Not too thick and it levels really well. Sand of the Sea is a clear base glitter topper with holo, red, gold, amber, and caramel hex and micro glitters. Shown here is one coat over OPI’s Hot & Coal plus top coat. Just like the previous polish, this topper is filled with glitters. I was really pleased with the formula here and the glitters stayed where they were first placed. It made for achieving full coverage really easy! 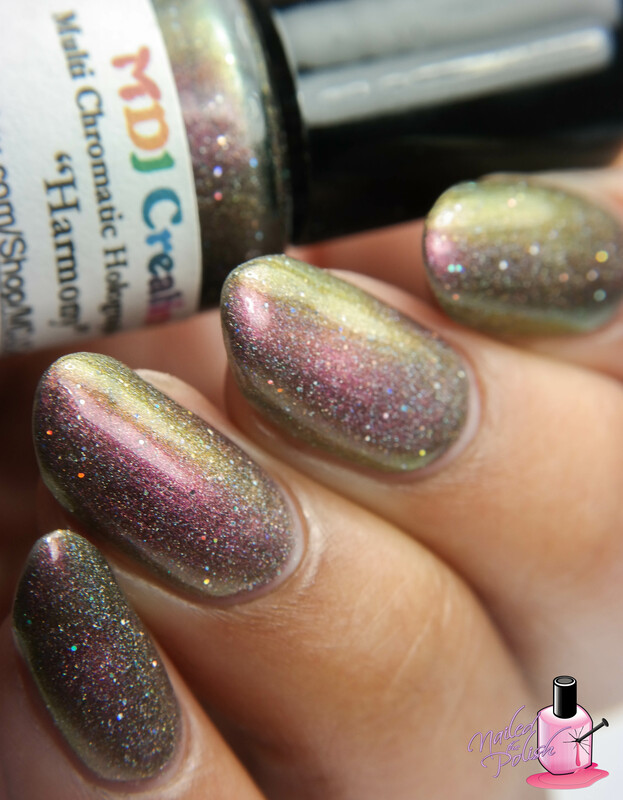 Harmony is a multichrome holo that shifts through violet pink, maroon, gold, green, and teal. Shown here is three coats plus top coat. This polish has a really great formula! It is on the sheer side so I still had a little bit of visible nail line after the third coat. It is recommended that you wear this polish over a black base to see the shifting effects more – I just wanted to see how this polish built up on it’s own. With or without a black base, this polish is really beautiful. Divinity is a multichrome holo that shifts through royal purple, golden copper, and red. Shown here is two coats over black plus top coat. I chose to layer this polish over black because it is much sheerer than Harmony. The formula is really nice and easy to work with. Dry time and leveling are nice as well. I really like the color shift here and the holo is pretty strong! Holo Top Coat is a linear and scattered holographic top coat. Shown here is one coat over OPI My Gondola or Yours? and NO top coat. This is probably one of the most holo top coats that I have ever tried. The holo is very liner, very scattered, and very strong! Formula is amazing and I can definitely see this polish being my new go to holo top coat. The King’s Bride is a clear base topper with color shifting shimmers and holographic hex, square, and bar glitters. shown here is two coats over OPI’s Palazzo Pants plus top coat. This polish is a little on the thicker side due to the color shifting shimmers but still workable. It has a good glitter to base ratio so you don’t have to fish for any of the glitters. I think this is a unique topper that would look really great over a dark base. Something Aquatic is a beautiful multichrome flakie topper that shifts through shades of blue, purple, and green with added scattered holo. Shown here is ONE coat over black plus top coat. This polish has a great flakie to base ratio! I was surprised – but really pleased! – at how well this covered in just one coat. It is really easy to apply and levels perfectly. I love the color shifts in this polish and the scattered holo gives it that extra oomph. Something Volcanic is a multichrome flakie topper that shifts through pink, copper, gold, chartreuse, teal, and violet. Shown here is ONE coat over black plus top coat. The color shift in this polish is the greatest of the three multichrome toppers that I swatched. It’s like a metallic rainbow all over my nail! Amazing flakie to base ratio and super easy to apply. Something Prophetic is an iridescent glitter topper with opalescent glitters and shards. Shown here is two coats over Finger Paint’s Honeydew plus top coat. This polish has a wonderful formula. It applies perfectly and levels very well. I only needed one coat of top coat to smooth all of the opalescent glitters and shards. I do wish that I swatched this over a dark base because the gorgeous opal shifts didn’t show up very well in my pictures – but trust me, it’s there! Last up is Something Angelic – an iridescent glitter topper with blue and violet shifting iridescent flakies and holo micro glitters. Shown here is ONE coat over black. So. Many. Flakies…!! Which is totally a good thing! They don’t move around much so it is really easy to cover your entire nail in one coat. The color shift in this polish is gooooorgeous! I was not expecting to receive so many different types of polishes to swatch but I am glad that I did. MDJ Creations is one of those indies that can do it all. I didn’t have any major issues with formulas and the majority of these polishes are unique to my collection (which says a lot!). And there’s plenty more to be discovered on their Etsy page! My favorites from the sampling I received are Something Angelic, Holo Top Coat, Sand of the Sea, and Something Angelic. 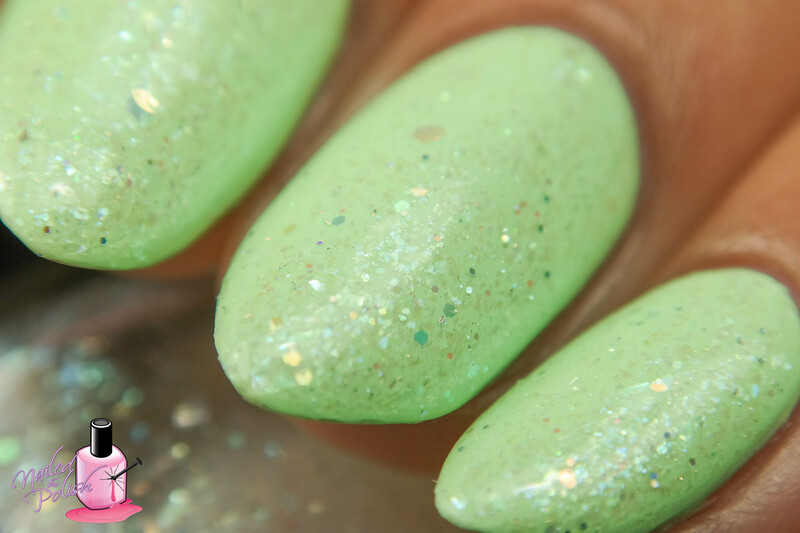 All of the polishes reviewed in this post can be purchased here in both mini (5 mL) and full (15 mL) sizes. Prices of all polishes range from $3.99 to $9.75 depending on size and polish type. For more, be sure to check out MDJ Creations on Facebook and Instagram!